Here’s the first news story I’ve seen about that voter registration lawsuit that was filed two weeks ago. The lead plaintiff is Jarrod Stringer of San Antonio, who relocated from Arlington in 2014. When he updated his driver license address online, Stringer believed that his voter registration records would be updated as well, the lawsuit said. That November, when he attempted to vote in Bexar County, Stringer was told he wasn’t registered here and was issued a limited ballot with only statewide candidates, the lawsuit stated. The four named plaintiffs each complained that they didn’t realize until it was time to vote that their voter registration wasn’t updated, as they believed. “Even though the state does not use information from online change-of-address transactions to properly register a voter at his or her new address, these transmissions may be used to cancel a voter’s prior registration record,” the petition added. Last year, the state rejected the plaintiffs’ proposals for dealing with transactions where the patron answers both yes and no to the prompt about registering to vote. The plaintiffs recommended automatically using the affirmative response, but the state said that could lead to registration of ineligible noncitizens. But plaintiffs’ attorney Mimi Marziani of the Texas Civil Rights Project in Austin said no legislation is required to remedy the problems. “Texas is violating federal law and the U.S. Constitution by failing to take common-sense steps to register eligible voters who update their information online,” Marziani said Friday. “Voters are supposed to be allowed to register to vote at their motor vehicle office at the same time they get a driver license or update their driver license. 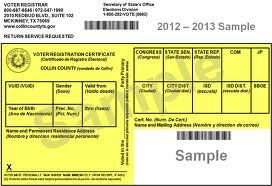 Under the law, that opportunity to register to vote has to be simultaneous … to the driver license process,” she said. The plaintiffs “are looking for an injunction that requires the state to simply transfer the information it’s already collecting online (at DPS) to state election officials,” Marziani said. See here for the background. The plaintiffs aren’t exactly asking for a lot here, and it’s hardly unreasonable to think that when one answers Yes to an “I want to register to vote” prompt that one will in fact be registered. As the story notes, the vast majority of these problems could be avoided with a bit of double-checking. The state just needs to follow the law.